PLEASE NOTE: THIS POST WAS WRITTEN IN 2010 AND REFERS TO THE KINDLE 3. I’ve had a Kindle, on and off, since August. (I’ll come to the “on and off” bit later.) People keep asking me what it’s like and if they should get one. So I thought I’d spend some time to try and answer all the questions I’ve been asked – as well as a few more things I’ve thought of. This isn’t in any way a definitive list of pros and cons (to be fair, it’s not even a list) and even as I’m uploading this post I’ve thought of loads more that I could have said… but this will do for now. Is it like reading a book? The first thing that everyone seems to ask is easy to answer: no, reading a book on a Kindle is nothing like reading a physical book. If you’re a book lover, then a Kindle – or any e-book reader – can never replace your books. Books have covers with illustrations and teaser text; paper that you can feel; a thickness you can measure. When you have your nose in a book, you can smell it. Of course a Kindle has none of these things (but, by gum, it’s easier to go on holiday with). So, yeah, if you love books, you’ll probably miss the multi-sensory side of reading. In bed, it’s a lot easier to read a Kindle lying down than it is to read a book. There are ‘next page’ and ‘previous page’ buttons on each side, so it doesn’t matter which hand you hold it in. Annoyingly, though, you can’t flick back easily like you can with real pages. If you need to reference something that happened a few chapters ago (say if a character turns up and you can’t remember who he is), you’ve got no chance. So reading on the Kindle is nothing like reading a book. On the plus side, though, it is also nothing like reading on a laptop, iPad or phone. It doesn’t have a back-light, so you need to have a reading light, but you don’t get the glare or the flicker of a ‘normal’ screen. I LOVE this about the Kindle. I used to stay awake reading stuff on my phone and then find it hard to get to sleep, but with the Kindle I drop off whilst reading, just like I do with books. How do you download books? Is it cheaper in the long term? No, it doesn’t work out cheaper. My Kindle was £109, then on top of that, you pay for each book you download. The Kindle version of a book tends to be around the same price as the paper version; sometimes a couple of quid less. Some very old (ie out of copyright) classics are free. I didn’t bother getting the 3G Kindle and I haven’t missed this function. If you have access to wi-fi, you probably won’t miss it either. The browsing capabilities on the Kindle are pretty lame, so I never browse for books – or anything else – on there. I just order books from my PC or phone and then sync it using the wi-fi when I get home. Disappointingly, the choice of books for the Kindle is very much limited and I haven’t really worked out what the rules are for this. I can understand why some of the smaller publishers might not bother publishing for the Kindle but I’ve been surprised at some of the omissions I’ve found (or, er, not found). I fancied reading some of Raymond Carver’s short stories the other night, for example, but none of them are available. Amazon reckons it has 1,702,955 ‘fiction’ books on its, er, books… but when you specify Kindle as a format, that number drops to 154,896. Ouch. This also means that my Amazon recommendations, honed pretty much to perfection thanks to ten years of buying (paper) books from them, have been absolutely ruined. Now, apparently, anything that’s available for Kindle is worth a punt. Today, it’s recommending The Adventures of Sherlock Holmes because I bought Digging to America by Anne Tyler, and Oscar Wilde’s The Picture of Dorian Gray because I purchased A Short History of Tractors in Ukrainian. I don’t know if that sort of thing bothers you, but it drives me crackers. What’s worse is that some Kindle versions of books have obviously been rushed out and have errors. This would never happen with a good book and it has bothered me a lot. I like to immerse myself in a book, but seeing even one or two glaring mistakes really distracts from the experience. The problems seem to be down to books having been scanned and copied automatically. One book I read recently had a number 7 every time the author had used an italicized I, as well as a host of other errors that could easily have been caught in a basic proof read. Whu… where are the positives? I know I’ve mentioned a lot of downsides in this post, but I don’t regret having a Kindle at all. Having 40-odd books available to me on holiday was amazing (well, ignoring the whole ‘broken’ thing) and since I’ve been home I’ve loved having the option of popping the ultra-slim Kindle into my handbag for long trips. It hardly takes up any room at all, no matter what I’m reading. Weirdly, I’ve also read more books in the last two months than I have done in the last two years. And Daz mentions that he’s started reading a much wider range of books since he’s owned his Kindle. I don’t really know why this is but I guess that, very vaguely, it’s to do with a perception – daft though it sounds – that you’re not committing as much when you buy a digital version of a book. I think what I mean is that, in the same way that the cover, font, paper stock, etc can compel you to buy (or at least feel some kind of affinity for) some types of book, it’s also likely to put you off others. So to be free of this and to see your bookshelf in a bald list of black and grey is actually quite liberating. Don’t compare having a Kindle to having books. There’s room in your life for both. Personally, my Kindle hasn’t diminished my love of books, but it has gone a little way towards broadening my mind (no, seriously! )… and now, I wouldn’t be without it. *Technically, of course, there’s nothing to stop you reading a Kindle in the bath as long as you don’t get it wet. But I’d imagine it wouldn’t be a very relaxing bath, what with all the worrying about getting your Kindle wet. 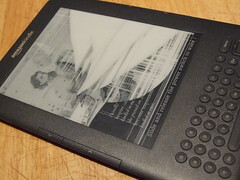 If I read your post before, I wouldn’t be careless too much to get my kindle screen cracked. I just found out this sad thing a few ago and I immediately did some searches to find out if there are some situations like mine. Now, I am sure that my kindle needs a screen replacement and it’s all my fault. I put my kindle under 3 heavy books for 2 days, ’cause I was busy with other stuff so I didn’t have time to enjoy with my kindle. I don’t know whether if I could be lucky like you or not because I’m from Vietnam, it’s too far and regarding the shipping policies, it would cost quite much to send one replacement here. I just bought it few months ago but via a third party and he doesn’t support me with warranty, I was too subjective thinking that everything would be okay with the kindle, so I just bought it without any commitment from him. Now, I think that If I could be lucky like you, I just have to pay for the shipping cost, that would be the best of it for me. Do you think I have any chance? My English isn’t so good and I can’t speak fluently therefore I think I wouldn’t have a chance if I talk to them. Could you help me out? Please give me some advice. Thanks in advance. I’m afraid don’t think it’s at all likely that you’ll be able to get a replacement Kindle. It sounds to me like you will just have to put this down to experience and look after your stuff next time, I’m sorry to say. But if you still think it’s worth contacting Amazon customer services then sign in to your Amazon account and fill in the contact form online. Your English is certainly good enough to explain what the problem is via email – I understood you very well – and their customer service is very good. They will be able to advise you much better than I can. Thank you so much for your kind response. I bought a leather cover also and the book was covered under the case when the thing happened, but fair enough, it was all my careless fault. Thank you again and good luck to you. I’ve had my Kindle since Christmas and use it incessantly. On Amazon, acquiring the titles you really want can be a bit of a pain, but there are ways around that – if you’re prepared to cross over to the Dark Side. My first purchase upon getting hold of my device was a CD from eBay containing 750 kindle books. This only cost £4.99 and I must say, I haven’t looked back – it’s more than I ever need and could bear to read. I tend to search eBook sharing sites too (www.ebookee.org for example). Most titles you want are there in PDF format and, once downloaded, can be converted to correct format via the free email you get with the registration of your Kindle. Yes, it’s a tad unethical I know – but I really wouldn’t stumble across most of the authors I now read and enjoy had I not done so. I still buy from Amazon, certainly far more than I did before I had a Kindle, but usually reserve purchases for small publications from independent authors: their stuff is very cheap and usually very good. Managed to find Raymond Carver’s Cathedral too if you want a copy! Very nice article, exactly what I wanted to find.